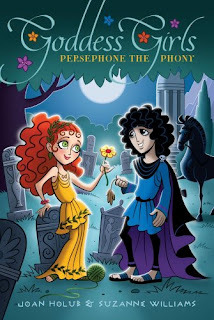 AS PERSEPHONE'S MOTHER ENCOURAGES HER to do, she often "goes along to get along" instead of doing what she really wants. But when she meets Mount Olympus Academy bad-boy Hades, she finally feels she has found someone with whom she can be herself. He's the first person who actually listens to her, and she finds herself liking him, despite the fact that the other goddessgirls think he's bad news. But if he makes her feel so special -- and so comfortable -- can he really be all that bad? If you've read my reviews on The Goddess Test by Aimee Carter, or Radiant Darkness by Emily Whitman, you would know that I am obsessed with the myth of Hades and Persephone. When I say obsessed, I mean it. One day, I saw Persephone the Phony featured in an In My Mailbox at Loving Books, and I knew I had to have it. I ordered it, and then immediately read it when I got it. I was actually surprised how small the book was! Only 130-something pages of text, and it was like triple spaced! This was definitely meant for a younger audience, but I still enjoyed it. It was fun to take a break from the intensity of YA and just read a cute, light read. Honestly, it took me 30 minutes to read it. I really liked the characterization of Hades and Persephone, and the overall take on the myth. It was such a short book that there isn't much to say about it, except for that I really enjoyed it. If you're a mega fan of the myth of Hades and Persephone like me, this is a very cute book to read and I definitely recommend it! I give this novel 4 out of 5 stars.